Cloud Imperium Games have just released their latest Around the Verse video, showing off the latest developments from the ambitious space sim. This time, the planet tech is zooming into focus, from space, right down to the dusty, or grassy, or sandy, or rocky ground. Be an intergalactic traveller in our list of the best space games. There’s been a lot of these videos over the course of its long development, but this one is among the most impressive. 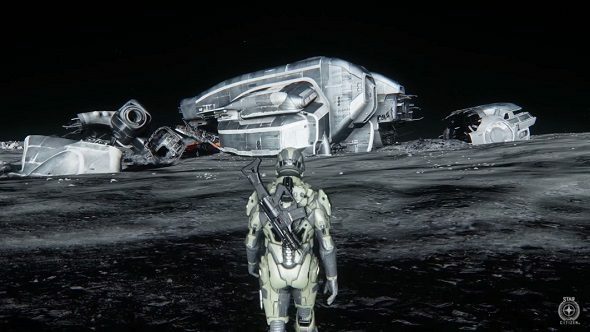 CIG show exactly how their procedural planet tech works, what makes it special, and how it looks when it’s all working as it should. Each planet will be unique, with its own gravity, atmosphere, and weather. There will be everything from desolate rocks to lush paradises. The latter will have trees with procedurally generated leaves, making them look distinct – another system allows the leaves to fall, while sound effects will make it seem like the wind is whistling through the branches. It won’t just be rocks and trees scattered over these planets either – there will be points of interest, such as derelict ships and outposts.